A reader asked me what to expect from the Mercury retrograde period that is starting today. I am getting that question from time to time. Will it bring more volatility? Will stocks go down? Will communications fail? I did some research on the Mercury cycle recently, so this is a good opportunity to share the results. I simply used the Dow Jones Industrials data from 1900 onwards, and compared stock market returns on Mercury retrograde days versus the normal Mercury direct days. With over a century of data, the sample has almost 6000 Mercury retrograde days and more than 24000 Mercury direct days. Over this 113 year period, the Mercury retrograde days produced an average 0.0205% daily gain, while the Mercury direct days generated an average 0.01822% daily gain. So, the Mercury retrograde days actually did a little bit better than the average day, contrary to what most (financial) astrologers believe. I then split up the sample in two periods, 1900-1950 and 1950-2013, but again I found no significant results, with the Mercury retrograde days performing just slightly better in both periods. Finally I took the 1950-2013 period and split it in two parts again, 1950-1980 and 1980-2013. This gave a more differing outcome. From 1950-1980 the Mercury retrograde days showed an average 0.0387% daily gain, more than double the 0.014% daily gain recorded in the Mercury direct days. 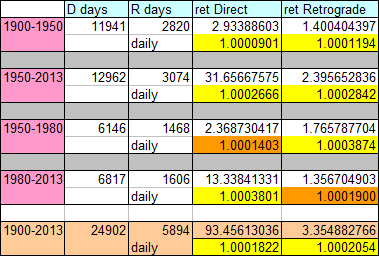 And from 1980-2013 we see just the reverse, Mercury direct days produced a 0.038% daily gain, double the 0.019% daily gain seen for the Mercury retrograde days in that period. The conclusion is fairly simple. The recent 30 years show a negative effect for Mercury retrograde days, but when we study over 100 years of data no such effect is evident. In fact, from 1950-1980 the dreaded Mercury retrograde days performed much better than average. This is actually consistent with the kind of results you would get from tossing a coin thousands of times. Over the long run you will get as many heads as tails, but for shorter periods of time you can and will get stretches where either heads or tails show up more than 50% of the time. This is no different from a gambler getting lucky (or unlucky) “runs” at a casino. I also checked whether the market is more volatile during Mercury retrograde periods, as is believed by some, but found that the average volatility has been just the same as on the Mercury direct days. Bottom line: there is no reliable edge in using Mercury retrograde for trading decisions. Belief that it affects stocks negatively is probably based on studying only the most recent 20 or 30 years of data. This shows how important it can be to look over longer periods. Something may seem to work for 10 or 20 years, but that can be due to normal statistical variations. Top 10 Things Not to Do During Mercury Retrograde. This entry was posted on October 22, 2013 at 7:55 am	and is filed under Financial Astrology. Tagged: mercury, retrograde, stocks. You can follow any responses to this entry through the RSS 2.0 feed. You can leave a response, or trackback from your own site. Computers entered the equation in the 80s, increasing the effects of misinformation and techno-glitches. I just checked and for 1980-2000 there was no difference between Mercury direct and retrograde days either. The different result comes purely from 2000-2013 and only from a few years, mainly 2002, 2007 and 2008. In these years the Mercury retrograde periods were hit by some serious declines (from financial crisis) and that weighed down their average performance over the entire period in consideration. For the other years since 2000, Mercury retrograde days have been very normal, even though computers have become widely used throughout this period. Lets ignore the averages and just look at “TURN ” dates. Is there a change in trend around the retrograde date? PS OFF SUBJECT I could send you the daily data for the SA market if that would help. It’s not a big work once the 100 year stock data and Mercury retrograde days are set up in a spreadsheet. What you suggest can be tested, but some objective criteria will be needed for what you would consider a “change in trend” and what will be “around” the retrograde date. And then you can run it through all the data to see whether such trend changes happen more frequently on the given dates. I have a source for SA market data, but I have to pull up and enter them manually. So, that’s what I am trying to avoid. To cover so many markets in my tables it has to be automatic For some markets I may chose the most commonly traded country ETF instead. For South Africa that would probably be EZA. The additional advantage would be that’s a ticker that traders around the world can buy and sell , while an official country market index is often not a product they have access to. So, that’s where I am leaning to for the moment. I plan to cover more markets and perhaps even some individual stocks. But it has to remain automatic and easy for me. I just tried your suggestion, but the result is negative. I calculated the 10 day and 20 day EMA, and checked how many crossovers between these average happened within a Mercury retrograde period. The idea is simple: if there is a change in trend when Mercury is retrograde, or about to go retrograde, then it will be evidenced by the shorter EMA crossing the slower one a few days later. Since a Mercury retrograde period typically lasts for about 16 trading days I used 10 day and 20 day averages, as they will respond quick enough to indicate the trend change. In my sample there are 19.15% Mercury retrograde days. But only 18.29% of the trend changes happened on these Mercury retrograde days. I then used the 8 day and 16 EMA, and then there were 18.15% trend changes on Mercury retrograde days. So, it looks like there are actually slightly less trend changes in these Mercury retrograde periods. Nothing suggests that Mercury retrograde has any effect on volatility or trend.